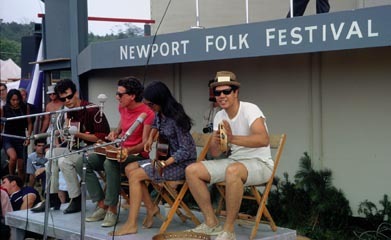 The Newport Folk Festival was renowned for introducing a number of performers who went on to become major stars, most notably Joan Baez (who appeared as an unannounced guest of Bob Gibson in 1959), and Bob Dylan, whose first Newport appearance in 1963 is generally regarded as his premiere national performance. 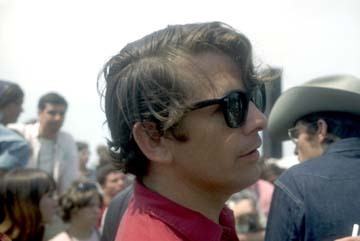 Dylan became the artist most famously (and infamously) associated with the festival. 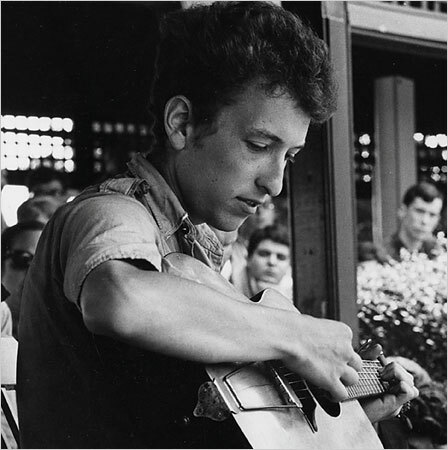 In 1963 and 1964, Dylan was accompanied by Joan Baez. 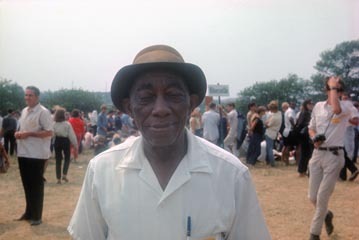 When he appeared there in 1963, people may not have known him but they certainly knew his songs. At that moment, Peter, Paul, and Mary were enjoying massive success due to their popular cover of Dylan's "Blowin In The Wind". 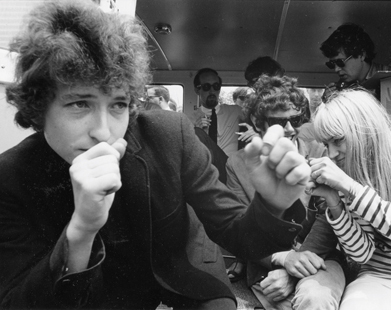 He was almost unknown when he came as Joan's guest, but Bob Dylan left Newport '63 a star. 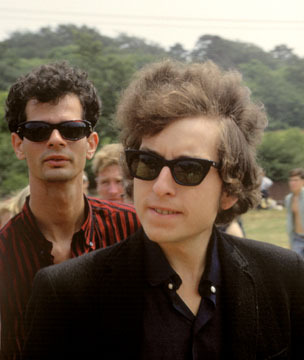 The Other Side of the Mirror is the wonderfully entertaining documentary about Dylan at the Newport Folk Festival 1963, 1964, and 1965. In this, we see Dylan as the acoustic folk performer making the transition to rock and roll. Probably the most important reason to view this documentary, however, is to observe Dylan’s visual, vocal and professional transformation during this short two year period. 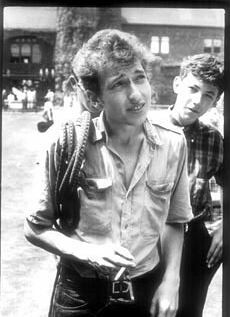 In 1963 Dylan is dressed in the de rigueur work shirt and denim jeans with an unmade bed of a hairdo. 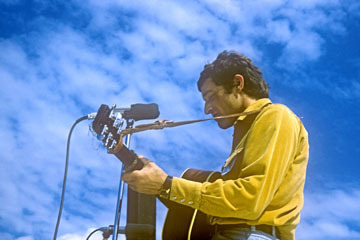 His voice is, to be kind, reedy and scratchy, and his songs sung at that time are things like Blowin’ in the Wind (done here with Baez and others in an incredible finale) and With God on Our Side (with Baez) reflecting the influence of traditional folk themes and of a style derived from his early hero Woody Guthrie. These performances send chills up and down my spine. 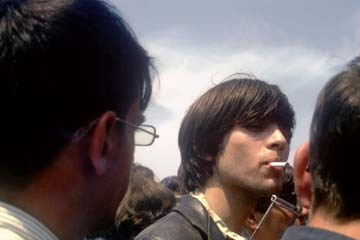 Newport 1964 is a transition. The hair is somewhat styled, the outfit more hippie than traditional folk garb, the voice is stronger reflecting the established fact that he is now ‘king of the hill’ in the folk world. And he sings things like the classic "Mr. Tambourine Man" that give a hint that he is moving away from the tradition idiom. Ironically, he performs "Mr. Tambourine Man" at the protest songwriting workshop. Newport 1965 gives us the new Dylan. The one that once we think we have him pegged slips away from us. Here we get no mixing it up with Baez or other folk singers but a rollicking blues band to play Maggie’s Farm and the-soon-to-be-anthem Like A Rolling Stone. Then back to acoustic with It’s All Over Now, Baby Blue and Love Minus Zero, No Limit. All done in a very strong and confident voice that says here it is, take it or leave it. This film, seemingly consciously, shies away from an investigation of any of the controversies of the time concerning the direction of Dylan’s work. 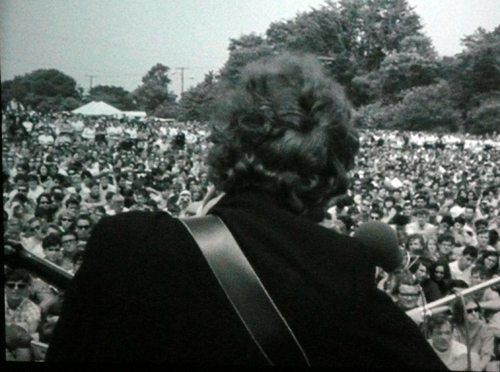 Pete Seeger’s only shot on film was to introduce Dylan at the 1964 festival. 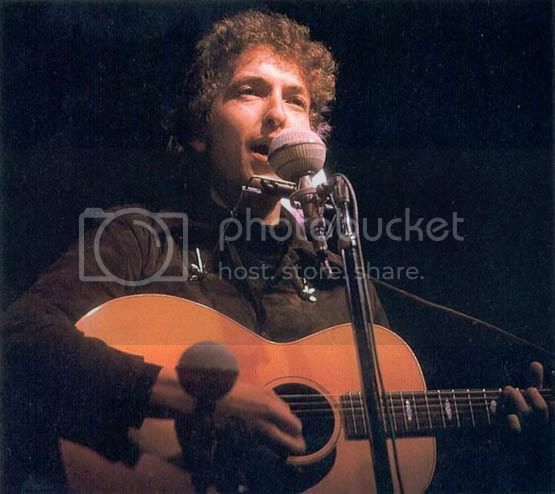 The most controversial subjects addressed seem to be whether or not it would throw the schedule off to give into the crowd and have Dylan play longer. This film will go a long way in solving any lingering controversy about whether Dylan belongs in the folk pantheon. We have all heard the stories about the madness that ensued when Dylan appeared on stage at Newport '65 with his electric guitar in hand, and a blues band behind him. 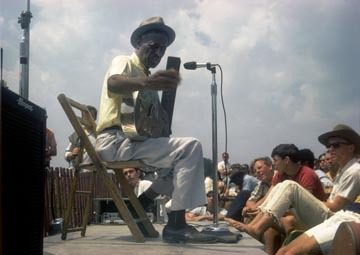 The audience was outraged that their folk hero went "rock and roll" at such a sacred festival; Pete Seeger even tried to cut the power with an axe! Yes, they're all great stories...but none of them are true. Personally, I've never believed that the boos that day were directed toward Dylan because of the actual music he was playing. YARROW: One, two. Can I have some volume on this microphone? Hello. One, two. Ladies and gentlemen, at this time there's a little microphone setup to be done. Cousin Emmy's a gas, right? Please don't play right now, gentlemen, for this second. Thank you. DYLAN AND GROUP: "Maggie's Farm,"
Yes, he will do another tune, I'm sure. We'll call him back. Would you like Bobby to sing another song? I don't know where he is. Listen, it's the fault of the, he was told that he could only do a certain period of time. Bobby, can you do another song, please? He's going to get his axe. He's going to get an acoustic guitar. Bobby's coming out now. Yes, I understand, that's okay. We want Bobby, and we do. The time problem has meant that he could only do these few songs. He'll be out as soon as he gets his acoustic guitar. All the booing you can hear from the stage is in response to things Peter Yarrow said, not to things Bob Dylan did. 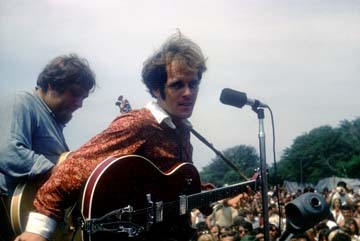 It was Peter Yarrow who first started drawing attention to what guitar Dylan was using. He twice said that he was coming back with an acoustic guitar, and he stressed it each time. I remember wondering at the time why Peter was making such a big deal of what instrument Dylan was going to use. 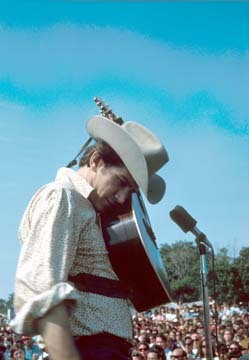 I've heard people say that Dylan himself gave proof of how upset he was at the boos when he came back to do those encores with that acoustic guitar rather than two more electric songs with the Butterfield group. Nonsense: Dylan and the blues band did three songs together because that was all the songs they'd prepared to perform together. They hadn't prepared more because they'd been told beforehand by us Newport board members that three songs was all they'd be allowed to do. I think that this was just another story from Dylan's much talked about career that got blown out proportion.